So, when I saw that she was coming out with a cookbook, Kitchen Confidence: Essential Recipes and Tips That Will Help You Cook Anything (Clarkson Potter, $19.99), I was really excited. For the entire month of May, I'm diving in & devouring Kitchen Confidence. For 31 days, I'll be making dishes from Kelsey Nixon's book & writing about them here. I know that's it's technically past May, but the last few weeks have been a little crazy for us. Throw in a sick husband & it equaled us not getting much of anything accomplished. So, think of this post as a bonus. :) I just couldn't pass up the opportunity to share this final dish with you, it's so good. This is a wonderful meal to make for a special night at home, and stunning enough to serve to guests. It's a great go-to for when you want a little something extra, but not a ton of work. 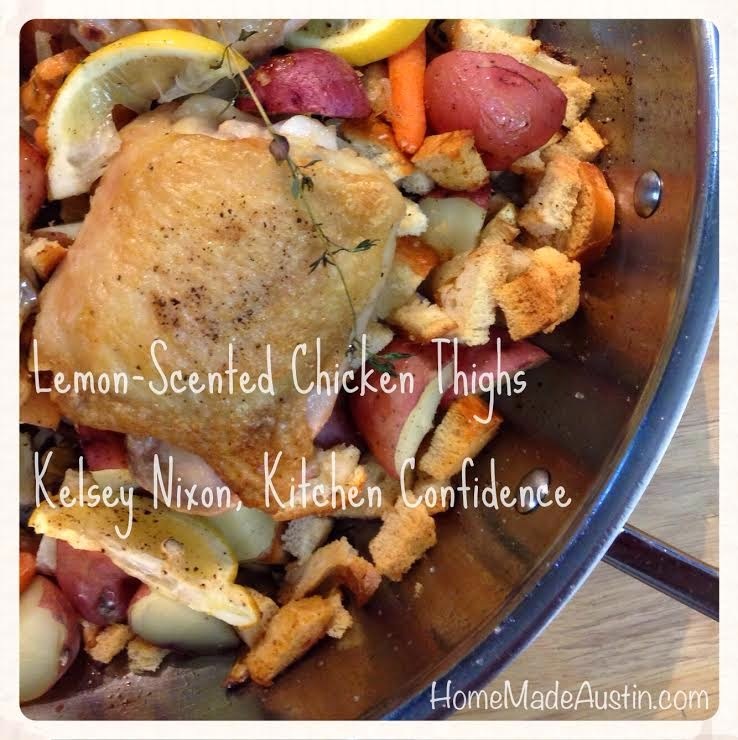 Kelsey Nixon & her team were even kind enough to let me share the recipe, so you can make these awesome chicken thighs yourself! Y'all, this dish has everything going for it. A total 10. The chicken thighs were so meaty & juicy. The veggies were cooked to perfection; there was just a bit of bite left to the carrots & the potatoes were just soft enough to be creamy. And the baguette croutons that were mixed throughout the dish, oh wow. They elevated the meal to something really special. I also loved that the lemon & thyme flavors were present but not too overpowering. There was just enough citrus to make it fresh & allow the rest of the ingredients really pop. I only wish we had doubled the veggies & croutons. They were so tasty I could've eaten an entire pan. We will so be making this one again & again. And again. Put the baguette cubes on a baking sheet. Bake until dried out, about 10 minutes. Remove the bread cubes & let cool. Leave the oven on & increase the temperature to 425 degrees. Meanwhile, put the potatoes in a pot, cover with salted water & bring to a boil. Cook until barely fork-tender, 10 minutes. Drain & let cool. 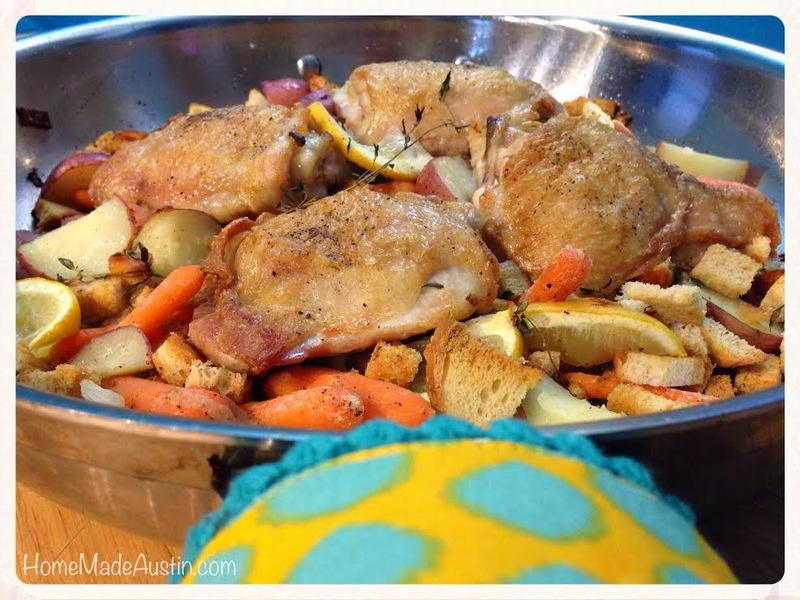 Set a 14-inch heavy oven-proof skillet over high heat & coat with canola oil. Season the chicken thighs with salt & pepper. Working in batches, if necessary, sear the chicken, skin side down, until golden brown, 4 to 5 minutes. Flip & cook the second side for 2 minutes. Transfer the chicken to a plate. Add the onion to the skillet, season with salt & cook until translucent and softened, 1 to 2 minutes. Add the garlic & cook for 1 minute. 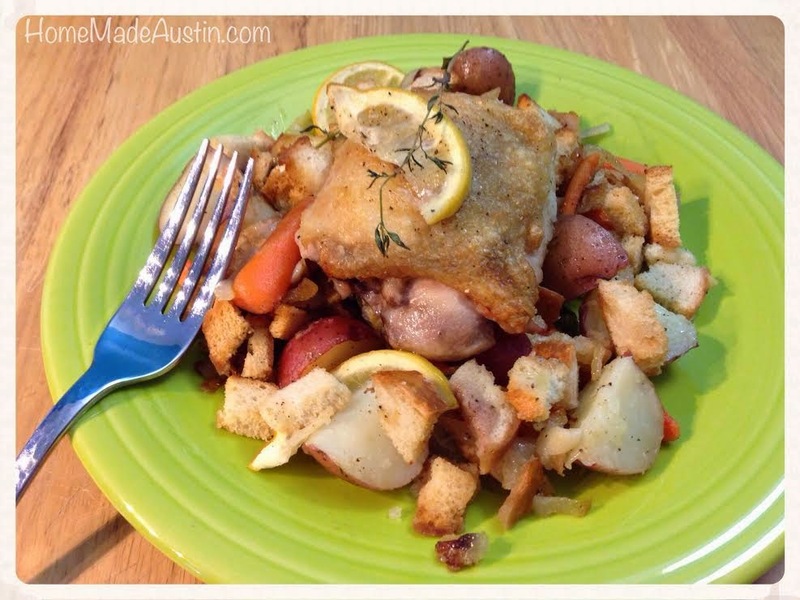 Add the baguette cubes, potatoes, carrots, lemon wedges & thyme; season with salt & pepper. Toss everything in the fat (add an additional glug of oil if the pan looks dry.) 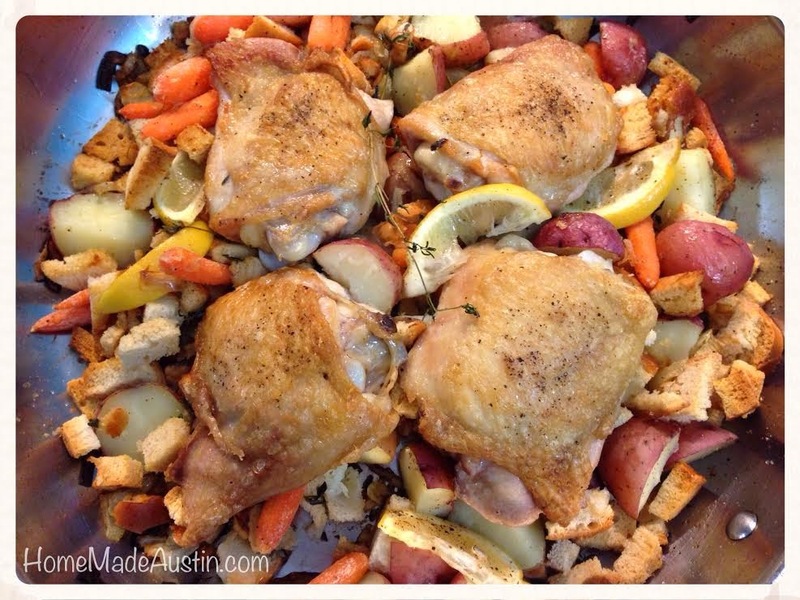 Arrange the chicken thighs on top of the vegetable and crouton mixture. Bake until the thighs are cooked through & reach 160 degrees on a thermometer inserted into the thickest part of a thigh, about 20 minutes. 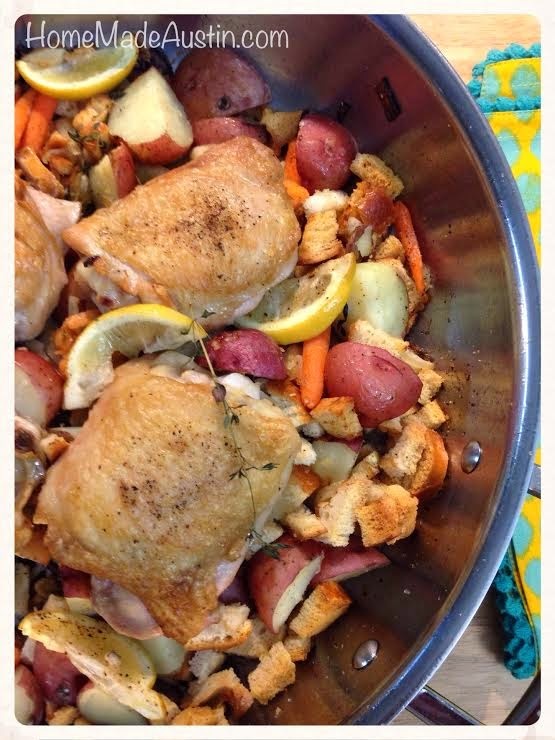 To serve, divide chicken and vegetables evenly among 4 plates or serve the dish family-style at the table.